Words are powerful, more powerful than you may realize. The words of God created the heavens and the universe. And since we are made in the image of God, it is your words that create the circumstances and accomplishments in your life. 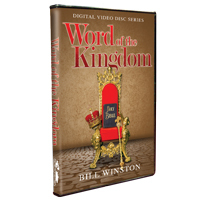 In The Word of The Kingdom Dr. Bill Winston shows you how to use the words of the Kingdom of God to radically transform everything in your life that is out of line with the declarations and promises of God.